There is a storm brewing in the GT class and it is forecast to erupt at Auto Club Speedway. Little changed at Road America, but clouds are on the Western horizon. The 15.9334-point lead Bryan Johnson has over second-place Danny Popp in the GT class of OPTIMA's Search for the Ultimate Street Car, presented by Advance Auto Parts, is deceptive. Most of that advantage came at the Charlotte event, where Johnson picked up 13.6 points on Popp in their head-to-head battle. the remaining point balance would essentially get thrown out, if the third double-points event were the deciding factor. That would trim Johnson's effective lead to 13.5333 points, as Popp had a slight edge (.067 points) in their other head-to-head meeting at the double points event at Michigan. Scenarios like that seem to be the norm in the second season of this series, as every class championship seems to be coming down to the wire. The discussion in the case of Johnson and Popp is irrelevant though, as Popp seems likely to run his GTL-class Corvette at Auto Club Speedway and will forgo any opportunity to capture the regular season title, in favor of preparation for defending his 2014 OPTIMA Ultimate Street Car Invitational title. Based on the past performance of the two competitors this season in GT, Popp could very well trim the deficit further and Johnson already proved the entire gap could be made up in one event, but that is unlikely to happen at this point. Instead, Popp will likely drop down to about fourth place in the GT standings and as long as those registered in the GT class for Fontana hold form. Jason Chinn will likely move up into the second position, but the only way he could catch Johnson and win the title, would be for Johnson to be unable to complete the event. Ken Thwaits would likely fall into third place in his black fifth gen Camaro (color seems to be the easiest way to keep track of his fleet at this point) and would need both Johnson and Chinn to falter, in order to claim a second consecutive regular season championship. Detroit Speed's Ryan Mathews is currently in fifth place and will likely drop a few positions after Fontana, because he is not registered for that event. However, his position is impressive, as he is currently the only competitor in the top-11, who has not run in at least two double-points events. Mathews has already qualified for the 2015 OUSCI, so his absence at Fontana will only make it that much easier for those who are trying to grab valuable points toward their entry. Seven of the top-10 in GT points have punched their tickets for Las Vegas, although Thwaits and Popp may elect to compete there in non-GT entries in the season finale. Six of the top-ten GT competitors have also registered for Fontana, which means points will be hard to come by, although Popp is offering some relief by running in the GTL class. That turns our attention to those outside the top-10 in GT points, as they are all scrambling to add enough points to their season-long totals, to earn an invitation to the OUSCI. As of right now, seventh-place Dannie Pinard is the top non-qualifier in GT and would receive an automatic invitation, if the season ended today. He is registered for Fontana and if he holds to form, he will likely move up a few positions and lock in that automatic invitation. After the top non-qualifier from each class is invited to the OUSCI, the next 11 invitations are handed out to non-qualifiers, based on their season point totals and does not take into consideration the class in which they ran. That means the next 11 could all come from GTV, if the non-qualifiers there had more points than anyone else in GTS, GTL or GT. That scenario is unlikely to happen, as qualifiers will probably end up being distributed around to multiple classes. However, the question is how many from each class will make the cut? While competitors may be scanning the point totals and running the math on various scenarios, are they looking deep enough into the standings to get the full picture? If they aren't looking all the way back to 20th place in the GT class, they may not be looking far enough. Andrew Nier sits in 19th with just 209.4 points, but Nier's Mustang is a strong enough contender, that could easily double his season point total at Fontana and do so without winning the qualifying invitation for the class. That could move him into the top-10 and into contention for an at-large invitation to the OUSCI. Other GT competitors looking to lock in at-large invites on points include Chandler Premo, Casey Woodside, Cliff Elliott, Gregg Guerrettaz and Craig Hardee. Woodside and Guerrettaz are not signed up for Fontana, which leaves their fate in the hands of others. Including the KN Spirit of the Event invitee at Fontana and the four class qualifiers at that event, there are 20 OUSCI invites that remain to be handed out at the conclusion of the regular season. There are nine competitors in the top-20 in the GT class, who have not received OUSCI invitations, so something is likely to give. While the final qualifier at Auto Club Speedway is sold out for competitors, fans can watch all the drama unfold in spectacular fashion, by purchasing a VIP Pit Pass online. 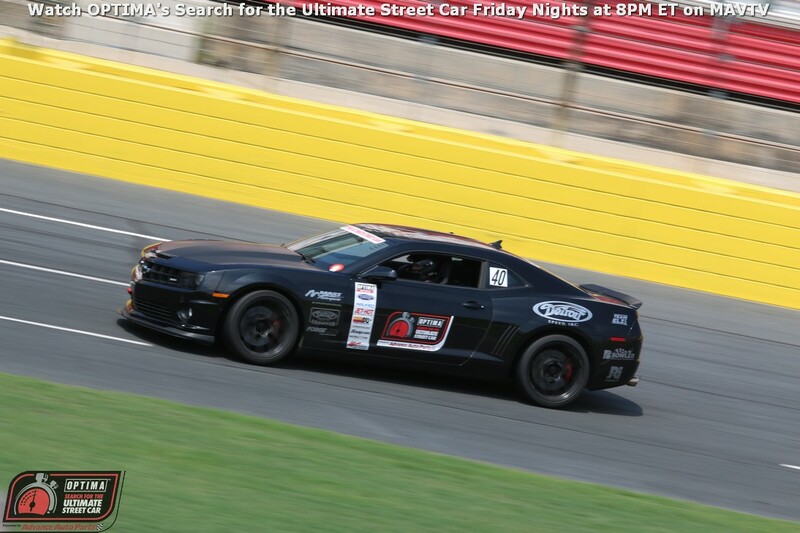 Don't forget to watch the video mastery crafted by Kevin Mooney, as OPTIMA's Search for the Ultimate Street Car, presented by Advance Auto Parts airs every Friday night at 8PM ET/PT on MAVTV.